In the state of Oklahoma a former veteran of the Air Force, who police say suffers from mental issues, has been arrested in a bizarre murder case of a 78-year-old woman. 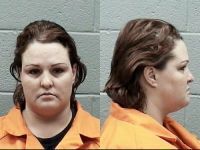 Investigators say, Kimberly Kay Hegwood, of Midwest City, allegedly admitted to various members of her family that she brutally murdered 78-year-old Alma Block and for no apparent reason. Hegwood is currently being hospitalized for an overdose and is expected to be taken into custody after she recovers. According to reports, Block and Hegwood met at a Walmart parking lot sometime on Monday afternoon. Hegwood is then believed to have offered the elderly woman help in unloading her groceries at her home. Hegwood then allegedly followed Block to her home, where police say she stabbed her in the neck and left her to die in a pool of her own blood. After killing Block, authorities say Hegwood later arrived at her own home (she had lived less than a mile away from Block) where she phoned a relative and told her what she had done. Hegwood is then said to have overdosed on some form of medication and was later taken to a hospital in Oklahoma City. Before being murdered, Block had been anticipating a prayer meeting scheduled at her church later on that day. Kim was the best friend anyone could have. She was sweet and caring and would help anyone in need. I knew she had bipolar and took medication for it but I'm just still in shock that she would do something like this. I'm so sorry for her family and the victims family as well. The lady Kimberly killed was a dear friend of mine, a wonderful, Christian woman and a true servant of God. It is beyond my understanding how she could do this. I know it was hard for her family to contact the police, but I am grateful that they did. I was in Alma's Sunday School class. We find it hard to believe that she would take up with someone in a parking lot. It would be more in her character to respond to an offer to help with groceries with, "No thank you, I can do it myself." She was a retired nurse and a wonderful help to many and a true Christian. She would be the first to forgive and I am trying. I am truly sorry for the family of her killer because I know how bad I would feel if someone in my family did that. I do want the killer to be locked away for life because I don't want anyone else to suffer Alma' fate. Alma is and will be sorely missed. I can only believe that God needed another angel in heaven. So sorry to have had this happen to such a good person. i am christian but i hope this lady is burning in hell. How can you forgive someone who did this to such a great woman? You say you are a christian "but" you hope shes burning in hell. Maybe you should go back and read your bible and pray some more. A true christian would never hope that "ANYONE" would burn in hell. Ms. Hegood will definately have to pay for what she did. She is mentally ill and I pray that God will get her the help she needs. My thoughts and prayers are with Mrs. Block's family as well as Ms. Hegwood and her family. Kim looks crazy, is dangerous and always was - just waiting to explode like all criminal do when an opportunity arrives. She deserves to be in jail. RIP to her innocent victim. Damn right she looks crazy and dangerous. When congress finally approves my 'Look Police' proposal we will get crazy-lookin' people like this woman off the streets before they even have a chance to commit the crimes they will so surely one day do. I went to Kim's wedding in 1997 in Ardmore. Her father was the Sheriff there for many years. I am still shocked and so sorry for her ex-husband. She did not look like the same lady that I knew. But it is her. Sometimes it makes no sense. Kim's "father" has been dead for 11 years. Why don't you let him rest in peace and leave him out of this. Fact remains, he killed an innocent woman. I do not care if she had the sweetest smile or the "psycho" look. A crime was committed and this woman deserves to rot in Jail. I bet many of you who knew her, only knew the good side - imagine if it was your mother or grandmother she killed. No sympathy for her. RIP TO THE INNOCENT SOUL. I'm sorry, Kim "may" have been "the best friend anyone could have" and she "may" be bipolar, but she maliciously and brutally murdered my Aunt, confessed to it and destroyed two families in the process with her evil, selfish act. She may be mentally ill and, if that is the case, then I do hope she gets the help she needs BUT she still needs to pay for the crime she committed and she needs to be locked away for the rest of her life so that she NEVER has the chance to do this to another person or another family. I do feel sorry for her family and what she has put them through but she MUST pay for the crime she has committed. With God’s help I will, someday, be able to forgive this woman but the anger that I feel towards her right now is too raw and too real. Yes, there is evil in this world and Kimberly Hegwood is a perfect example of this fact. Anyone who can brutally murder another person in this manner is evil and will do so again. She MUST be stopped. ... Or, to look at it another way, a perfect example of the fact that there are mentally ill people in this world, bah! i dated kim in highschool,it didn't last long after she tried to stab me with a pencil. So go figure she's a nut. My prayers go out to the victims family. I have known KIm since she was Kimberly Kay Abernathy in gradeschool and I never would have thought that she would do such a thing. We were VBF's thru most of our school years and I am truly in shock. I want to express my deepest sympathy to the victim's family and to Kim's family, she has a wonderful mother. Kim was a good friend all thru school and we always got along. She has totally shocked me with this news. I mean she had a temper, but I never thought she was capable of this. She has always been Kim Abernathy to me, even when she called me from Germany where she was stationed. I guess you dont really know what anyone is capable of, look at the astronaut chick, she had a lot to lose and was punished as well. I knew Kim when we were just teenagers. She used to be my best friend until she made a terrible mistake in our friendship. I did not know that she was bipolar which explains alot! God is our judge...not people! It is a tragedy that such a nice lady lost her life but just think...now she is rejoicing in Heaven! You don't realize what bipolar disorder does to people and families. It is a tragedy in it's own! I am so terribly sorry for both families and hope that God is with them all during this time. To the guy that said Kim "tried" to stab him with a pencil. I remember you very well. You left out the most important part of the story. She took up for herself after you tried to beat her up but you ended up getting the short end of that deal. Be glad it was her you dealt with and not me. Any man that would beat on a woman deserves more than you got!!!! So anybody that stabs another in the neck leaving them to die deserves something too.